September Sweeps! Spotlight on Local & Small Business Month-long Raffle! Congratulations to the Daily Prize Winners! September 17: Kevin McNamara -- $100 Gift basket from W.S. Badger Co. 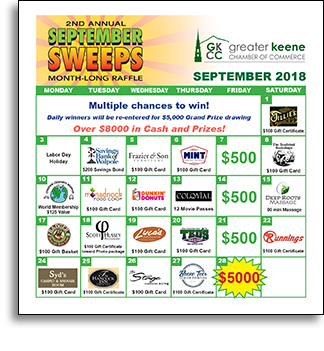 Thanks to all of our sponsors and participants who supported the Chamber’s September Sweeps Raffle! So many great prizes to win! 24 chances to win Cash or Merchandise! All daily winners will be re-entered for a chance to win the Grand Prize of $5,000! between 10:00 am and 4 pm. Winners will be notified by e-mail and/or by phone. Click on the "Register Now" button above to purchase tickets online.